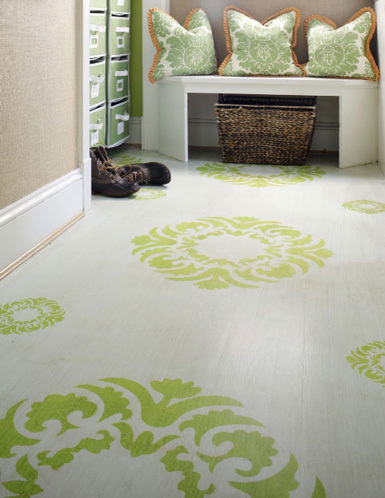 belle maison: Painted Wood Floors...Would You Do It? 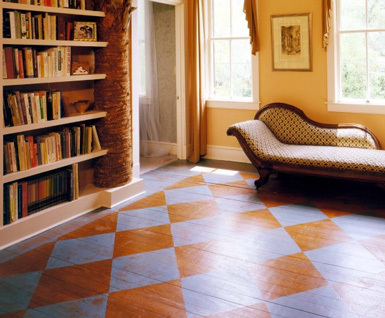 Painted Wood Floors...Would You Do It? 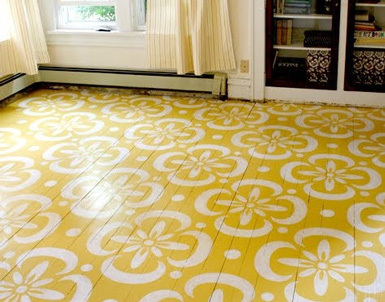 Every time I come across a painted wood floor, I ask myself, is this something I would ever commit to doing? I love the way painted floors look - whether it's a large scale pattern or solid color, there's something very unique and original about these floors. According to interior designer Scott Yetman, “It’s a great way to add interest to a room since you still get the texture of the grain but with a much more uniform colour (and it’s easy to touch up scuffs or scratches).” “It creates a very contemporary Zen feel in a room.” (quote from Canadian House & Home). I guess the only thing that scares me what a serious commitment it is to slap down a coat of fresh paint on a stained hardwood floor. You know what I mean? Designer Mary McDonald is famously known for her boldly painted floors, often times in large scale geometric patterns (and they always look amazing!). How do you feel about this idea? Is it something you would try or have you already done it? I'd love to hear your thoughts! If you're ever interested in attempting it yourself, here's a great DIY article with step-by-step instructions. I wanted to do it soooo badly, but it was one of the first times ever that my husband was dead set against my great idea! So I didn't. do it. But look at how gorgeous these are! I love evey single one! I like the look of painted floors but if its a solid color or minimal pattern like the stripes in the kitchen. 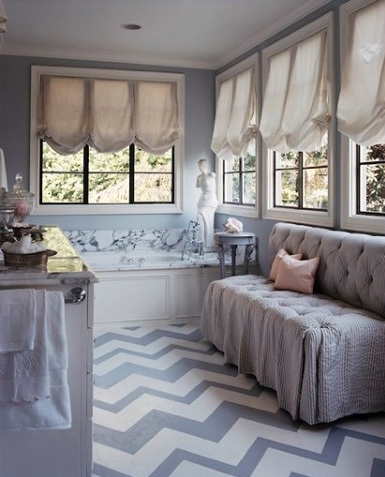 But I do love the Chevron one on the bathroom. I love this blog, it makes me want to revamp every room in my apartment! You find so many great ideas! 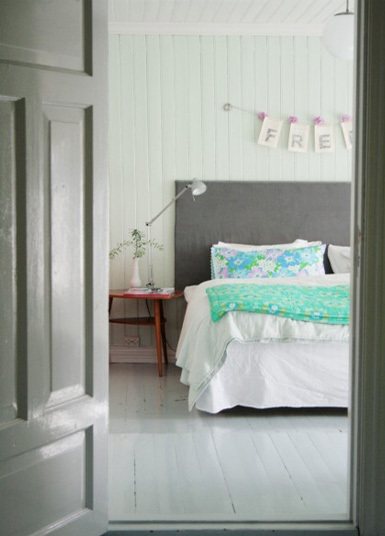 These painted floors are beautiful, I love the green bedroom floor, it looks comfortable and serene. I think painted wood floors can look really cool, but I hate the idea of destroying gorgeous nautral wood floors. I would be more prone to paint the wood floors if the natural wood was some what destroyed and this would be a good option to add some new life to the floor. I think it is kind of neat! I don't think I would do it in my house, but it's still fun to admire it in other's houses. I would do it in a kids room for sure! FUN!! @ Be Inspired, I love the idea for a kids room! Jules, I've just started following you on google reader and am so glad I found you! Regarding painted floors: My father painted the floors in our dining room...back in the early 70s! 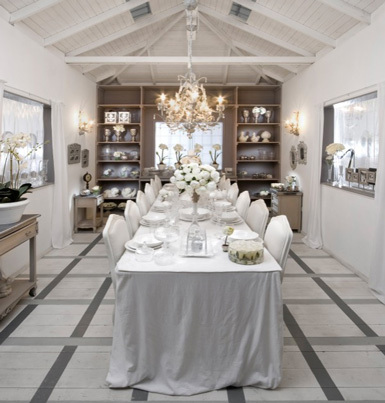 Yes, they were gorgeous: painted stark white with a stunning blue chinoiserie pattern repeated on the floor. Our dining room table was a polished nickel base with a clear glass top...he was a bit ahead of his time. The bad part? We had a flooding issue and the floor warped in the corner. We never fixed that one spot because it wasn't worth it to strip the whole darn thing and redo the floors. My house now is all hardwood floors stained a dark walnut...and I'm not messing with them! My design side is saying YESYESYES, my brain is saying, NONONO and $$$$. I never know who wins! Great ideas though! That is a tough one... I love painted floors, but hate taking away from a beautiful hardwood unless something happened to the floors where it wasn't feasible/economical to fix the hardwood. I love your blog and have picked up some good ideas in the short time I have been following. Thanks. i actually prefer wood flooring over carpeting and i really love painted floors. i would do it no problem. not sure about the patterns, but painted one solid color, you betcha! have a super relaxing weekend julie!! I love them would do it in a sec! ...but I have a husband who says differently!...But thanks for the daringly fabulous floor inspiration! Those floors are gorgeous. But I don't know if I could do it. Love the shabby chic white diamond room and the balloon shade room. Who knew grey could seem so inviting? I'd planned to do it in a Bungalow I renovated in 2009 that was intended to be my long time home....the painted floors got nixed when plans changed and I ended up finishing the renovations to sell the house without ever having spent a single night in it. 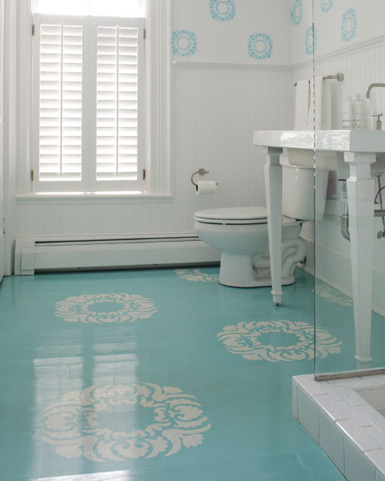 I still dream of the painted floors in the 2nd floor master suite though! Love the look but I agree with most of the other comments above... it is a very big step to take against hardwood floors. And very hard to reverse. There'd be no way I'd consider doing this in my house. We didn't even know we had any until we were told by our son's pediatrician that all carpeting in the house had to go (severe allergies & asthma). Surprise! Surprise! Under the carpeting was 1" honey colored oak hardwood. Here we thought we were going to have to put in a sub-floor & laminate. The boys and I went to Grammy & Granpa's for a long weekend and my husband refinished the entire upstairs (3 bedrooms, living room and dining room). After all that work, he's become a little possessive of the hardwood floors. I'd have to get a divorce first and after 22 years, he's just about trained! I think I would also have a problem doing this. But do you think it is possible to do something similar with tiles? Often the tiles are plain white or have very terrible colors around here (Germany) ... and I am wondering if it would be possible to paint them instead of ripping them out and putting new ones in ... Have you ever heard or read about something like that? I live in a colonial home that is 60 some odd yrs old. Lived here 13 yrs. Have always had carpets: even the owners before us have always had carpets. Recently I decided after quite some time of thinking of it started tearing up the carpets. The hardwood floors need some tlc. I just may take all I have read and seen in this blog into some serious thinking and then doing. 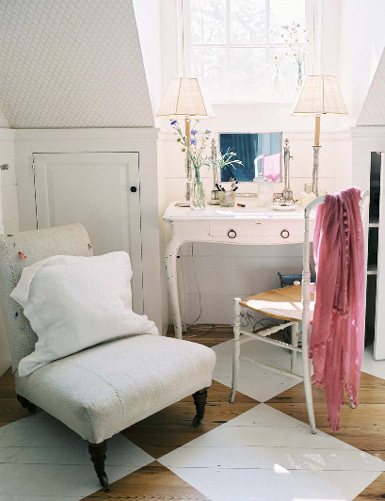 Love the bedroom floor pic (white) looks rustic...love it!